Dr. John Joseph Prendergast is an accomplished scientist, doctor and a humanist. As a young man he overcame a severe learning disability and as an adult, he sought relief for an inherited physical health problems. Dr. Prendergast has subsequently empowered countless patients in the art of self-care for more than thirty years. The scientist's tireless, ground-breaking work on heart disease and diabetes has won him numerous awards. Dr. Joe Prendergast has been a practising GP for over 30 years. 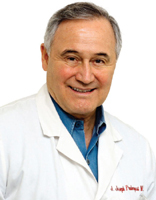 He is Board Certified in Internal Medicine as well as Endocrinology and Metabolism. A graduate of Wayne State University in Detroit, Michigan he completed his residency at the University of San Francisco. Dr. Prendergast has published nearly 40 medical articles in well-known publications such as the Journal of the American Medical Association, The New England Journal of Medicine and Diabetes Care. In 1986, Dr. Prendergast formed a single speciality endocrinology practice, Endocrine Metabolic Medical Centre and a non-profit research foundation, The Pacific Medical Research Foundation. In 1999, he founded DiabetesWell, an eClinic that managed patients with diabetes lead healthier, longer lives. Dr. Joe is a pioneer in the potential of L-Arginine (the precursor for Nitric Oxide) to dramatically affect cardiovascular health. He is the product designer of the nutritional supplement ProArgi-9 Plus. Dr. Joe has used this product on over 7,000 patients. The American Diabetes Association named him Father of the Year. Of Dr. Joes large high-risk, patient population less than 1% has experienced a stroke or heart attack when they have followed his L-Arginine protocol.